Spring Break is almost here. This is a much needed and earned break for staff and students. After the break we will be making our big push into the testing session. Fortunately, I know our students are prepared and will be highly successful. Before we run for the doors as the break begins, please take a moment to go over the below checklist to give your electronics a much needed break as well. Before you leave on Friday, please make sure you take care of a few last minute tasks. Shut down your desktop computers and monitors. They need their rest as well. Shut down all laptops…yes…even the ones in the carts. All electronic devices need to be shut down from time to time. It is best for the device. Please be sure your projectors are turned off. We want the bulbs lasting as long as possible. Power down your document cameras. Power down any iPads or iPod Touches. Press and hold the power button until you get the “Slide to Power Off” option. I would also NOT plug them in to charge. Make a note to charge them on when you return. Keeping a device charged in all the time can have a negative effect on the battery life moving forward. Be sure all your SMART or Promethean pens are put someplace you will be able to find them. Be sure all your remotes are put someplace you will be able to find them. Lock everything up if you can. Better safe than sorry. 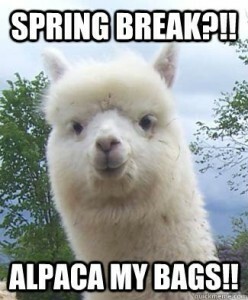 I want to take this opportunity to wish you all a great Spring Break! I hope your time is restful and full of joy as you spend time doing whatever it is YOU like to do. Safe travels to those that are venturing away from home. See you when you get back.